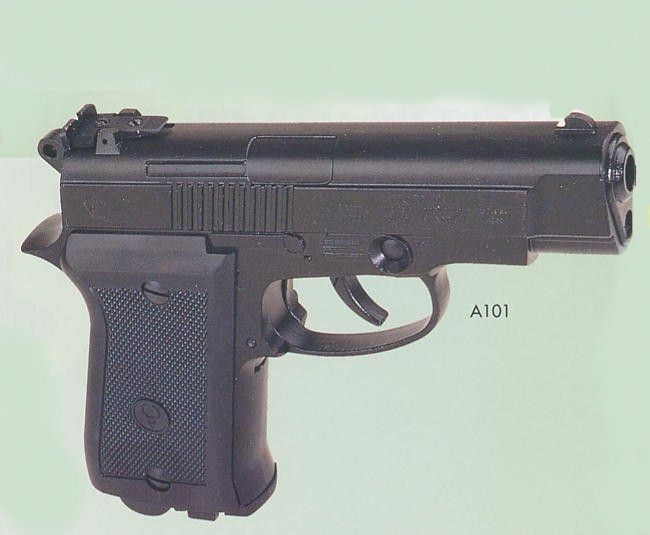 New SKIF A-3000 28 shot CO2 repeater pistol, single and double action. 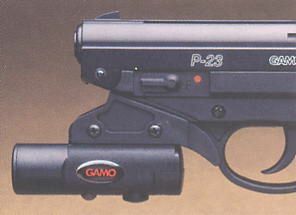 Excellent quality 28 shot repeater CO2 powered .177 pistol. 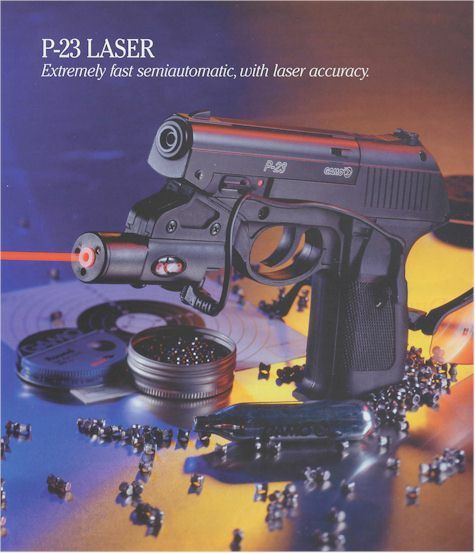 Very good range with excellent accuracy and the convenience of only having to reload every 28 shots! 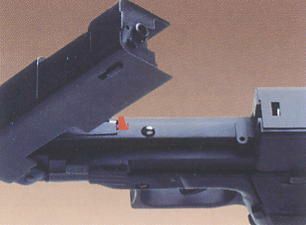 Barrel length 4" 6" or 8"
two versions are available, the AG640 and the AG635, the AG640 has a metal top whilst the AG635 has a plastic one. The guns are virtually identical to look at. 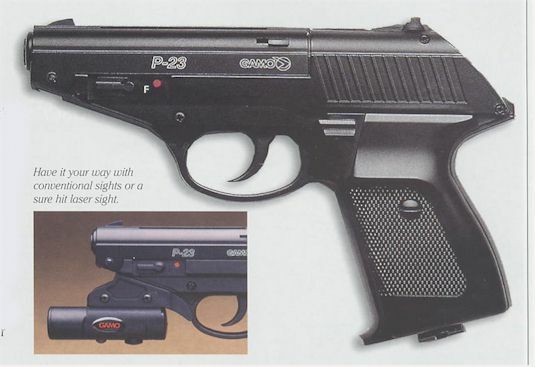 Now available this brand new CO2 airgun is a fast firing gun. 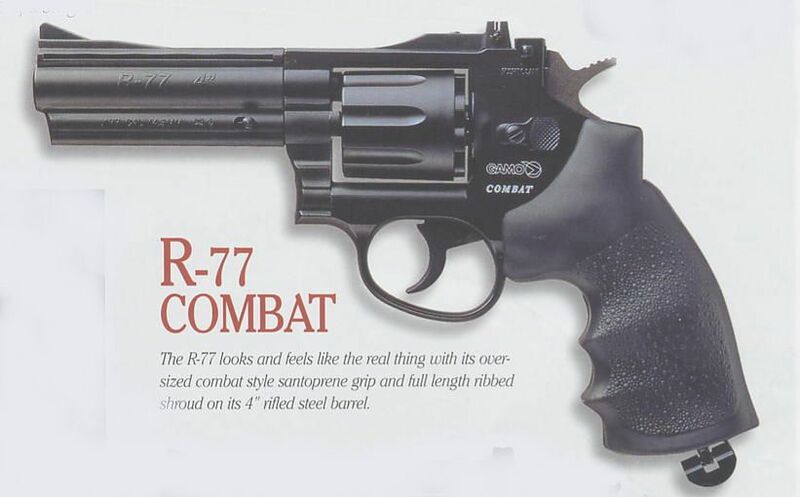 Manufactured in heavy steel the realism is total and up to 13 shots pour out as fast as you can pull the trigger. Fires steel BB shot. 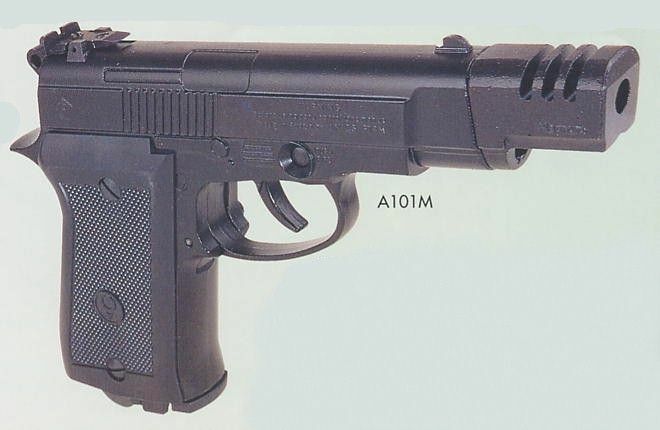 Powered by CO2 these new generation handguns from russia offer muzzle velocities of up to 500 fps and fire .177 steel BB's in semi automatic mode. 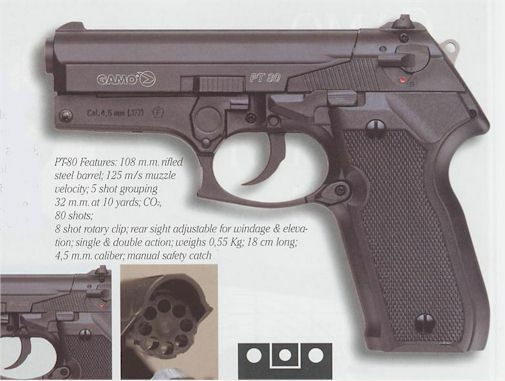 Each model has a 15 shot magazine authentically housed in the grip, and a safety catch. 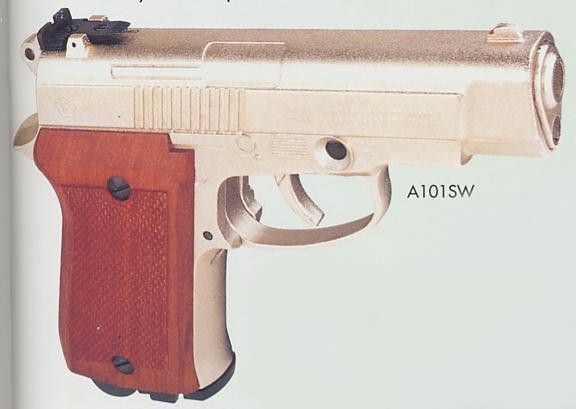 Anics A101SW same spec as above but with a nickel finish and hardwood grips. 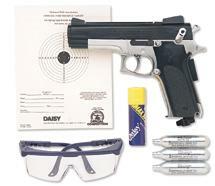 Model Daisy 45 gas powered pistol suitable for standard lead .177 pellets. 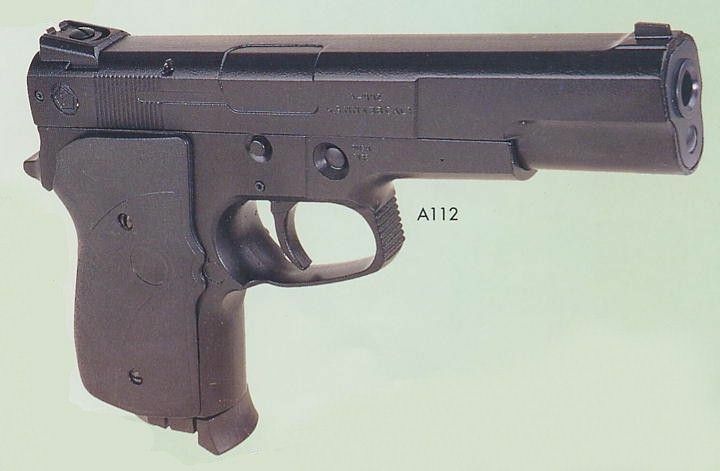 13 shot repeater air pistol. Uses standard CO2 gas cartridges. 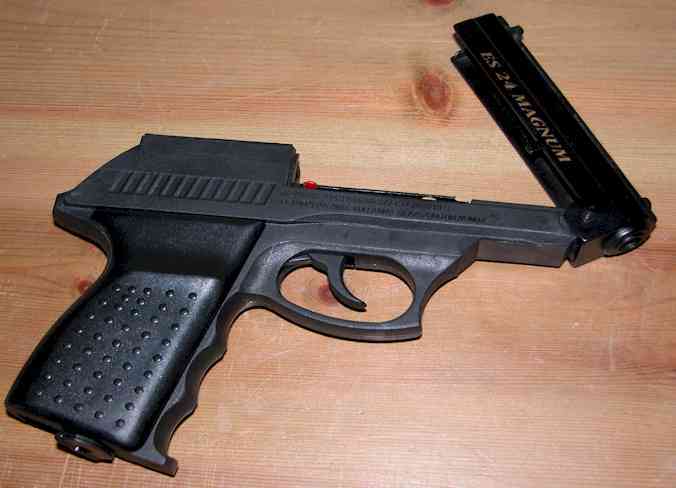 A classic look in a pistol that shoots pellets....looks like the real thing. Lightweight. Easy to use. 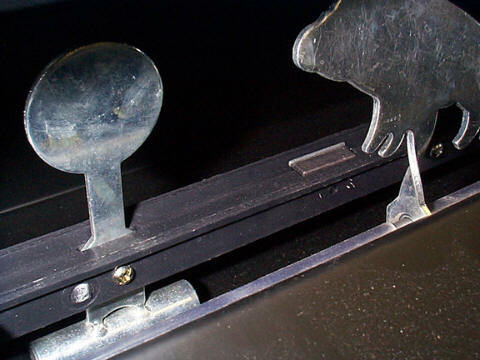 TRUGLO® fiber optic front sight for improved accuracy. 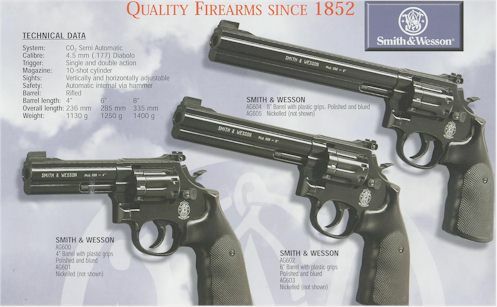 Built for year after year of shooting enjoyment. MUZZLE VELOCITY: 400 fps. MAX. SHOOTING DISTANCE: 224 yds. OVERALL LENGTH: 8.5 in. WEIGHT: 1.25 lbs. The 400GX makes its mark with distinction. Striking gold-plated body with black textured grips. 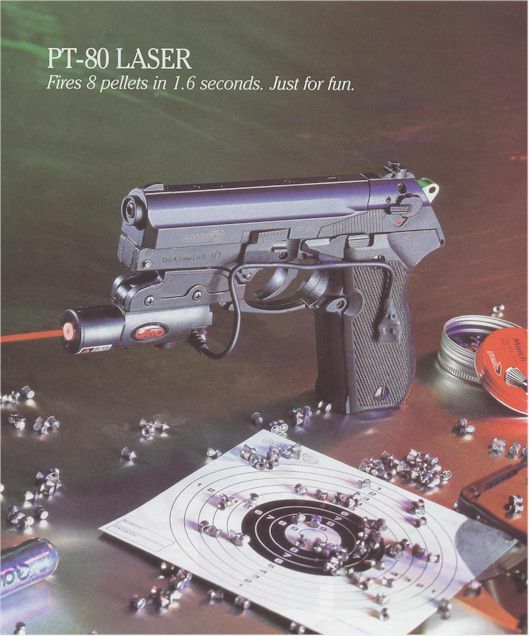 An excellent choice for introducing a shooter to the fun of handgunning the PowerLine® way. 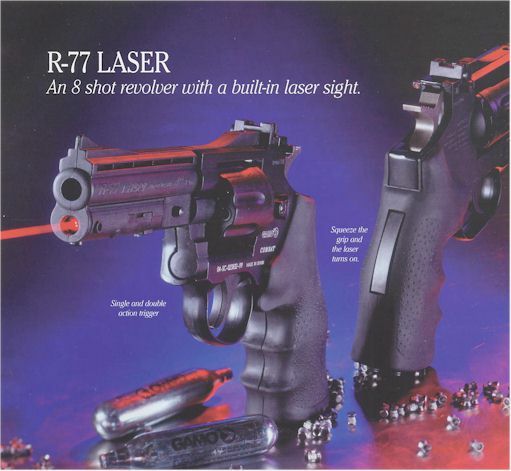 MUZZLE VELOCITY: 420 fps. MAX. SHOOTING DISTANCE: 240 yds. OVERALL LENGTH: 10.7 in. WEIGHT: 1.4 lbs. 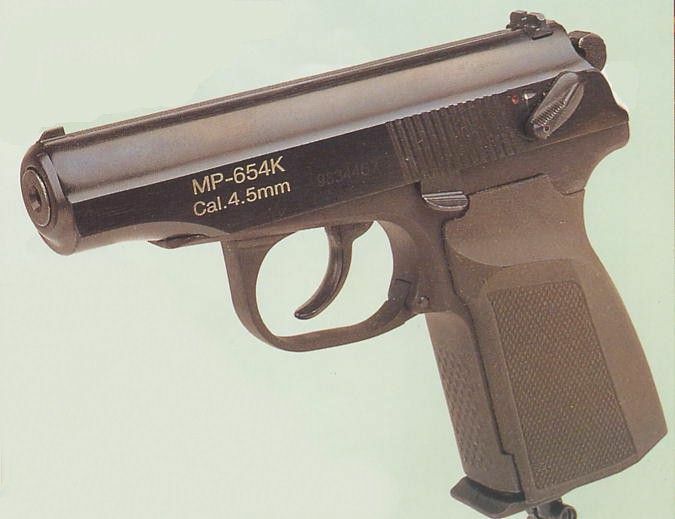 This superb replica pistol is from Diana and is a top quality target pistol. 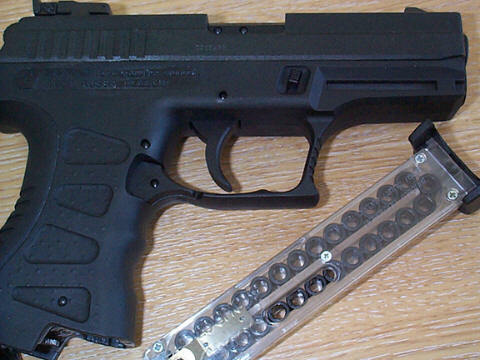 8 shot .177 pellet magazine Weighing in at over a kilo the gun is very stable in use. 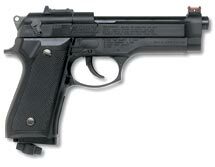 This big .22 caliber semi-auto gives you the look and feel of the real thing, and big power, too. 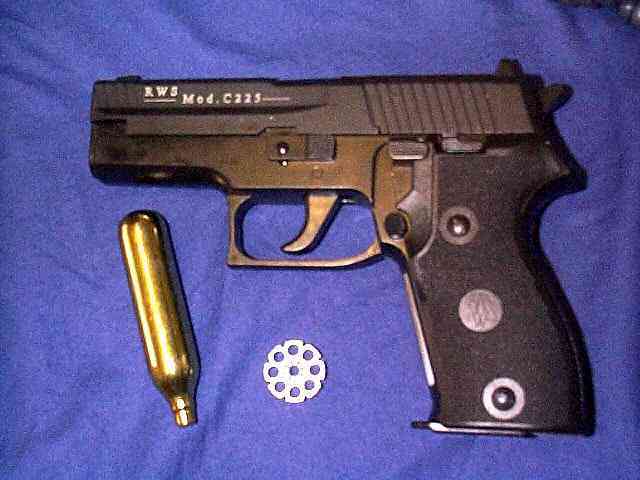 Shoots both flathead and pointed .22 caliber pellets from its 6-shot rotary clip. TRUGLO® fiber optic front sight delivers the ultimate in accuracy. 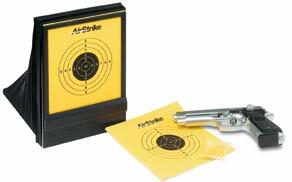 KIT Contains: Airstrike 240 pistol 15 round clip 10 colorful paper targets 100-count 6mm synthetic ammunition, flat folding pop-up target trap with mesh backing for fast ammo recovery. 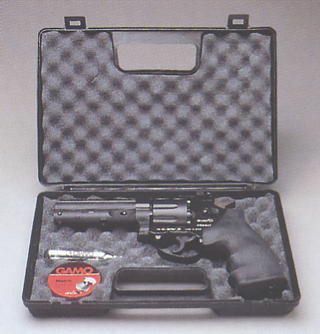 Daisy Powerline Model 15Xk Shooting Kit. Everything a shooter needs to begin enjoying the fun of an airgun. 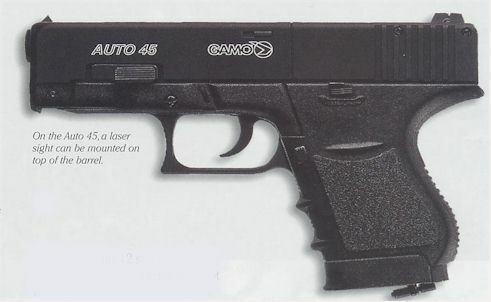 Blade & ramp front sight, Fixed open rear sight, 15 Shot built-in magazine that is easy to load. Smooth bore steel barrel, tub of 350BB's inc. Velocity-425fps. 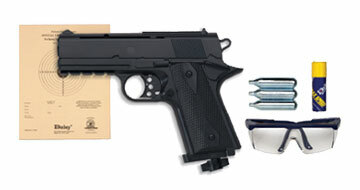 The exciting new Model 693 BB pistol in a pre-packaged kit that's ready to go. Includes a pair of shooting glasses, 350-count BBs, 3 CO2 cartridges and a pad of official airgun targets. 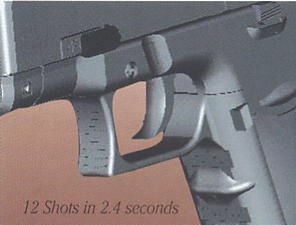 Everything a shooter needs to enjoy the fast action of handgunning. 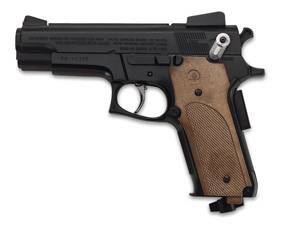 This CO2 powered BB pistol backs up its "custom" good looks with state-of-the-art performance. 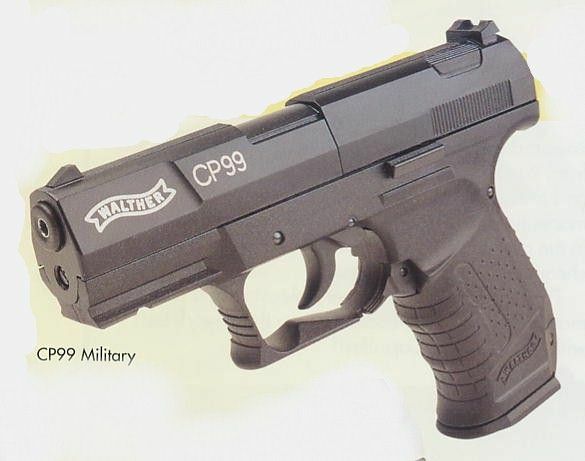 The 693 is a 15 shot semi-automatic BB pistol with a nickel finish that helps make it one of the most attractive pistols on the market. The Model 93 combines high performance design with styling that's a natural for action in the field. Convenience is built in with the drop-in clip that delivers 15 rounds in seconds. 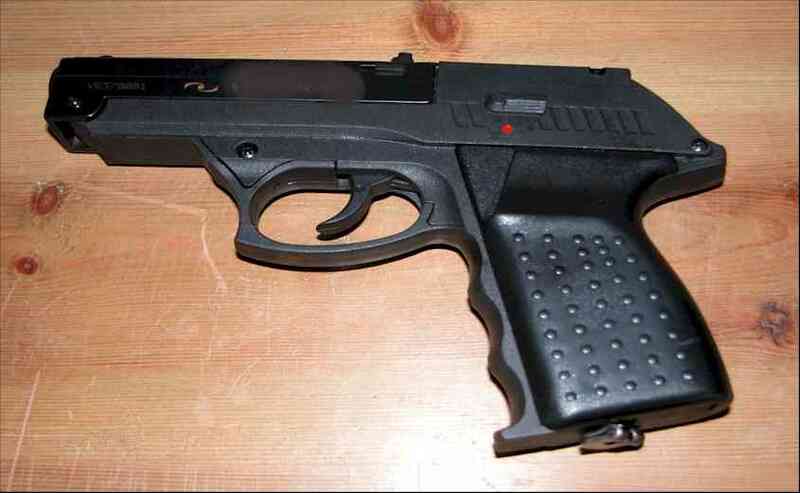 This superb replica pistol is again from Diana and is a top quality target pistol. Weighing in at over a kilo the gun is very stable in use.